Plan your schedule right on your desk with the Terry Redlin Desk Pad Calendar! Perfect for the outdoorsman, Terry Redlin's picturesque rural artwork and nature-inspired scenes line each month. 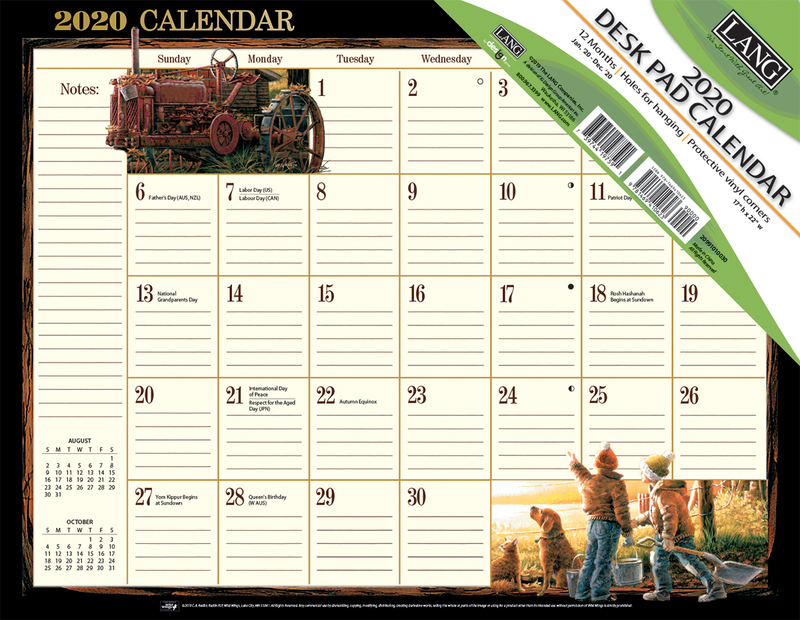 LANG desk pad calendars feature large grids for scheduling, a sturdy backer board for easy writing and clear plastic corner protectors. Using a desk-pad calendar is a great way to make certain your schedule is always right in front of you. Never forget an appointment or task by writing it down a on a desk pad calendar. Featuring multiple sizes and scheduling formats, desk pad calendars are perfect for filling with notes, meetings and anything else you can think of! Desk pads are a great tool for planning and note taking on their monthly or weekly calendar grid. Stay on track every day and never forget an appointment, call, or grocery list! Medium Square - Square Grid height is between 1.5" and 2"